Yes! Time and again we have experiences of homeowners leaving behind important items at their previous place. Some even forget to load and pack a 42″ Samsung LCD TV because it has been stored under the stairs. To avoid this from happening, include it in your checklist. 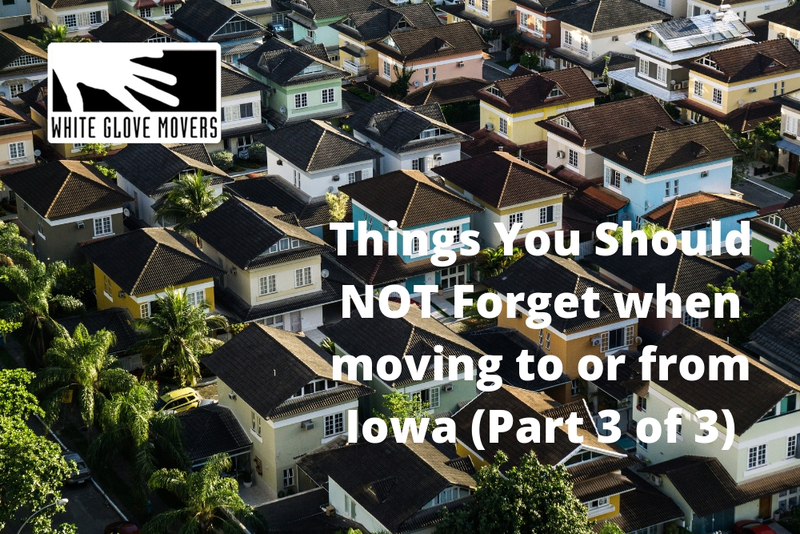 As a secondary precaution, assign this checklist to one of the family members who have very little thing to do during the move. In this manner, he can focus on ensuring all of the items that have to be moved out goes right into the moving truck. Of course, with a professional moving team here in Cedar Rapids, we do our best to guarantee none of these mishaps will ever happen. We do our own checklist based on the number of boxes you have earlier told us that we will be putting on board White Glove Movers moving truck. Thus, it is always best to coordinate all of the items that will be part of the move with your professional movers. After all, they are the ones who are skilled and knowledgeable in handling these things. They’ve been doing it dozens of time in a week and have learned to master its process very efficiently. Yes! Unless you want to hide it, but it is but logical to tell people that you are moving to a new address. This saves lots of effort from your mailman and your friends sending over gifts and letters to your old address. You may also consider it as a courtesy to your friends. Come out clean by informing everyone about your move and where to send future correspondences, too. Otherwise, you may find yourself receiving a call from someone who is completely disappointed because they have embarrassingly walked into your old address thinking it is still your home. Just imagine the embarrassment that poor person may have experienced. Ultimately, do the planning ahead of time. This means not doing it the week before your move but around four to six weeks before your scheduled move day. This will save you from a lot of stress and unwanted mishaps. It will also give you better quotes and more efficient moving team in Cedar Rapids.